Innovative's modular display system, Staxx, is a completely configurable pole based system that supports up to six monitors. Once your system is locked into place at the desired height using the new anti-rotation clip and collar, a single modular component can support anywhere from one tilter head to several different combinations of arms and up to six monitors. 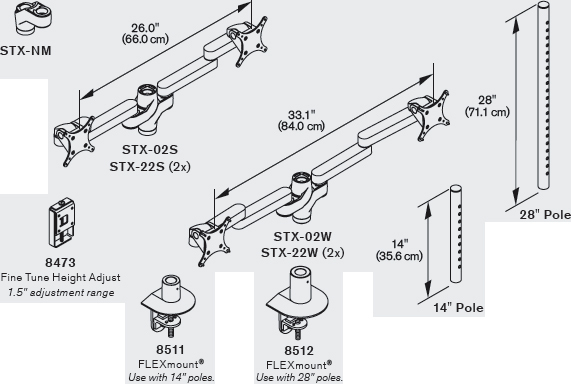 Scalable Solution - Staxx is easy to install and reconfigure, more monitors can be added by simply adding more of the same parts. Large Screen Sizes Welcome - Staxx is capable of mounting three monitors, up to 30" wide, side-by-side. Independent Monitor Adjustment - Flexible extension arms allow you to position the monitors for your perfect viewing angle. Small Footprint, Big Capabilities - Designed for modularity, Staxx can accommodate up to six monitors using a single mount. Staxx is as sleek as it is functional. It supports up to six monitors to a solid mount that requires little desk space. Workspace configurations are continually changing and evolving. Staxx makes it easy to adapt to your changing needs with little time or effort. Staxx allows you to work and feel better throughout the day by making it easy to create your perfect viewing position. Independent monitor tilt, pivot, and rotation gives you control to work in comfort. 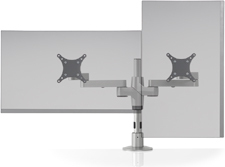 Mount two monitors side-by-side with Innovative STX-02W Staxx. This dual monitor stand can support monitors weighing up to 20 lbs. each. The adjustable monitor stand design enables monitors to be positioned for maximum comfort. Staxx shown with (2) 27", 16:9 monitors.